Cake pops must be one of the best baking inventions ever. It is the perfect party food for young and old, and can easily be decorated for any occasion from a toddler’s birthday party to a wedding. 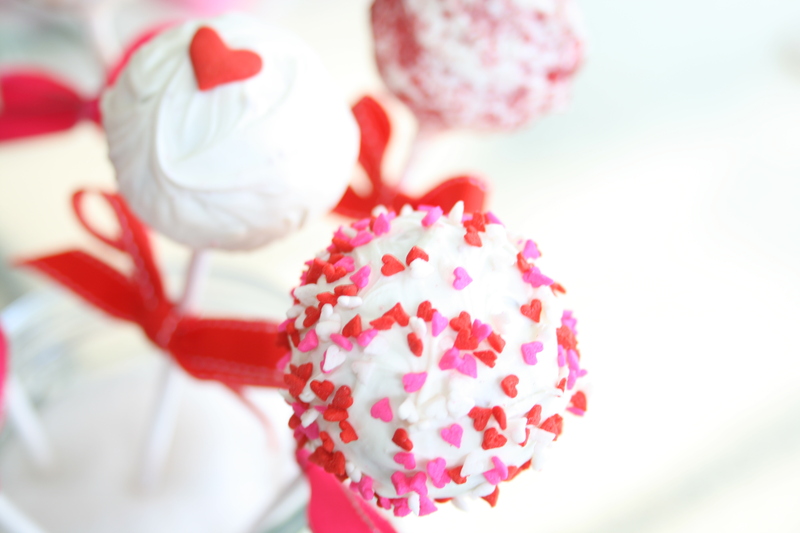 A cake pop is made by crumbing any normal cake and stirring through frosting to create a moist and sticky consistency. You then roll it into little balls (or any shape depending on the decoration) and attach it to a stick. The whole thing is then dipped into melted chocolate and decorated and is ready to eat as soon as the chocolate has set. A lovely friend of mine has a first birthday coming up for her cute-as-a-button little boy and we got talking about party food the other night. 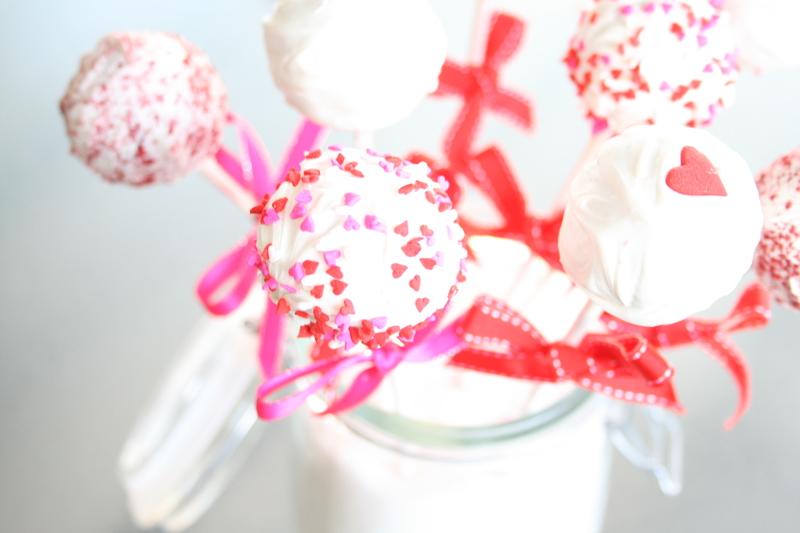 Naturally cake pops came up, and I promised to do a step-by-step post on how I make mine. This is how I make my cake pops, and I just do what works best for me and should by no means be taken as the perfect method. I first had a look at Bakerella on how to make them and would highly recommend checking out her site, if for nothing else but the amazing ideas. The one thing I would mention is that it is quite time-consuming, just because there are a few different processes, so make sure you start on them early. But you could save some time by buying a plain, unfrosted cake from a bakery or your local supermarket and a tub of frosting which you can find in the baking aisle in most large supermarkets. Or you could buy the box cake mix also available in the baking aisle. 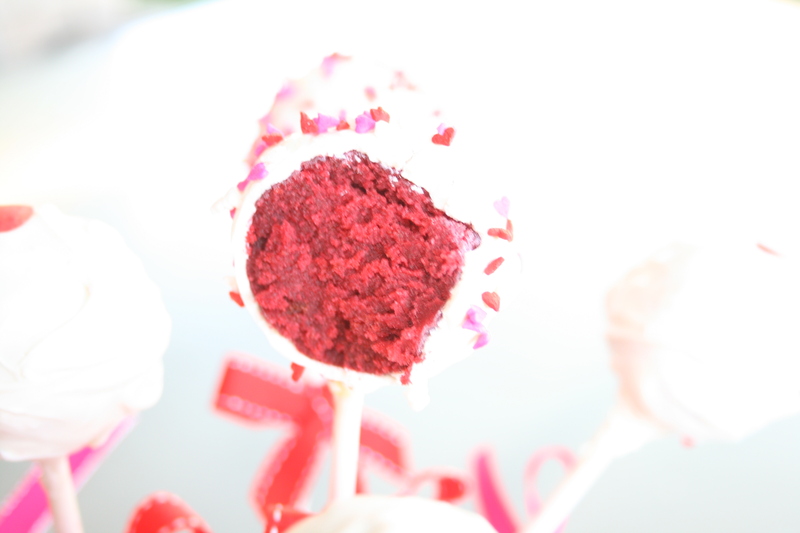 The cake pops I made was red velvet with a cream cheese frosting, dipped in white chocolate. You can use any flavour combination of cake and frosting, whether fruit/citrus or chocolate. I normally decide on a colour scheme, then find some ribbon that will match and treat myself to a trip to the cake decorating shop for some specialty sprinkles. Although in saying that, most of the large supermarkets here in Australia has a growing collection of sprinkles and decorating supplies. Have a look at what they’ve got, otherwise I would recommend Cakes Around Town, which has a huge online shop. This is also where I buy the paper lollipop sticks that I normally use, but craft shops such as Spotlight will stock this too. 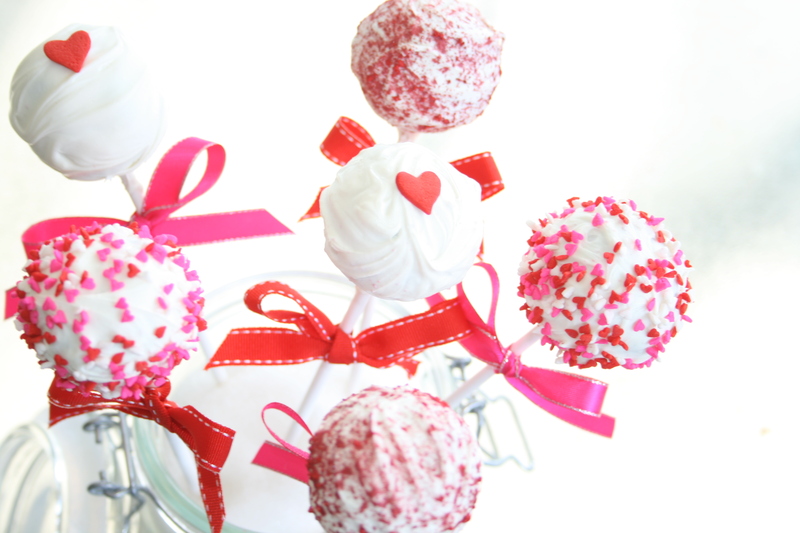 If you can’t get hold of lollipop sticks, you can always make the cake pops without it by dipping each ball into the melted chocolate and just placing it on a plate to decorate and set (these are called cake balls). To hold the cake pops upright and slightly separated so that they don’t bump into each other, I use a glass jar filled with sugar. If you can get hold of a styrofoam block you can use this and cover with wrapping paper matching your colour scheme. You can also wrap them individually in cellophane candy bags and tie with the ribbon if you are transporting them elsewhere, or don’t want them standing out exposed. Bake (or buy) a cake. I used the red velvet recipe from Joy of Baking. This cake produces around 48 cake pops, depending on the size of your cake balls, if you don’t need this many you can cut the cake in half and freeze the half you’re not using for later (just remember to half the below frosting recipe as well). Crumb the whole cake either in a food processor, or if doing by hand, rubbing big pieces of cake together causing it to crumb. Make (or buy) the frosting. I made a simple cream cheese frosting by creaming 50g of butter, adding 1 tsp vanilla extract, whipping in 1 cup of icing sugar until light and fluffy, and mixing in one 250mg tub of cream cheese. Stir the frosting through the cake crumbs to create a moist and sticky consistency. Roll into small balls of about 3cm wide (I use my ice cream scoop to ensure all the balls are evenly sized). Place the cake balls into the freezer for about 20 minutes to firm up. They will be soft from rolling them between warm hands, and will be too hard to coat with chocolate unless they are a bit more firm. In the meantime you can tie any ribbons or other decorations to the sticks, I find it easier at this stage rather than when the cake balls are already attached. Then start melting your chocolate. I would recommend starting with a cup of melted chocolate and adding and melting more as you go along. 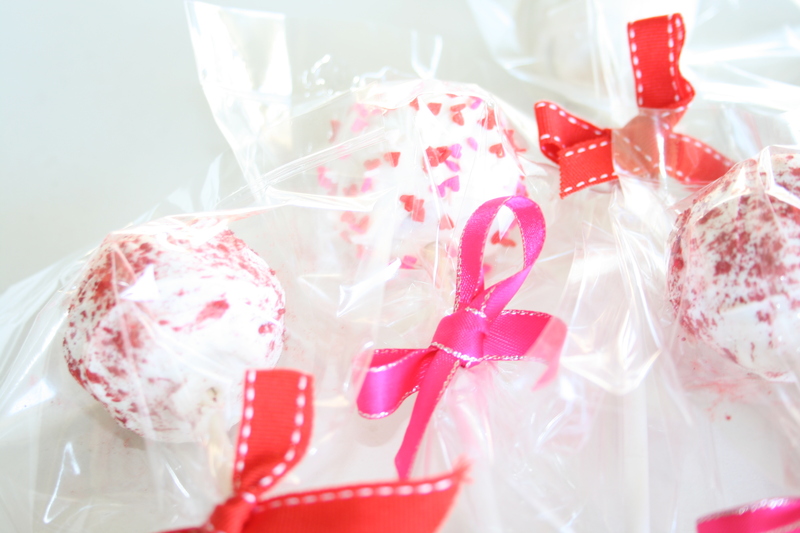 It will help having it in a deep bowl, to easily dip in the cake ball without touching the bottom. Dip the tip of a lollipop stick into the melted chocolate (about 5mm deep) and insert into a cake ball. Be careful not to insert the stick all the way into the cake ball. Repeat this step for all the cake balls and let them rest for a few minutes for the chocolate to set. This step ensures the cake ball is attached strongly enough to the stick to be dipped into the chocolate without falling off. Once the chocolate has set you are ready to dip each cake pop into the melted chocolate. For me, this is the most challenging bit but just keep at it, you will soon find the hang of it. Dip each cake pop all the way into the melted chocolate making sure it is covered with chocolate all over, remove from the chocolate and hold the cake pop at a 45° angle over the bowl and then very gently tap the base of the cake pop on the side of your bowl so that any excess chocolate can drip off. Sprinkle any decorations over the cake pop, or pipe a pattern with a different colour chocolate then stick the cake pop upright into the jar of sugar (or into the styrofoam box) for the chocolate to set. Repeat with each cake pop.